What happens if my ookyo plan doesn't auto-renew and how do I set it up again? Can I delay or stop auto-renewal of my ookyo plan? Your ookyo plan will turn from Active to Grace. Grace period lasts for 50 days and you can only receive incoming calls and SMSs. 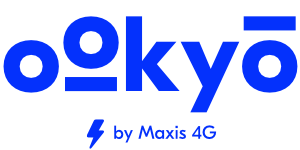 To re-activate your plan, you need to manually log-in to your app to pay (HQ > click on 'activate base plan' > redirected to Maxis Pay to pay). When in Grace, you won't be able to use your internet data so we advise that you connect to Wifi to do this. If you are using the same card that you used upon registration, your auto-renewal will continue for the following renewals. Your 30-day active period will resume from the date of successful renewal. If you do not reactivate your plan within the 50 days Grace period, your service will terminate. Any ookyo credit, Google Play Rewards, services, and your number will be forfeited. *Note: If you had selected NO for auto-renewal upon registration, you will not be able to set up an auto-renewal.